Wheelersburg senior Cameron Llewellyn signed his letter of intent to play soccer and attend Shawnee State University. WHEELERSBURG – Playing soccer at the collegiate level has always been a dream for Wheelersburg senior Cameron Llewellyn. Wednesday evening, Llewellyn made that dream a reality when he signed his letter of intent to play soccer and attend Shawnee State University. Llewellyn leaves behind a legacy for Wheelersburg soccer that will go down as a pretty outstanding four year run. He was a member of the Pirates team that during his freshman season won the SOC II outright, and as a team during his senior season that won the SOC II outright, coupling that with a sectional title and a district finals appearance. Llewellyn will be joining the Shawnee State men’s soccer program that has a number of local players from Scioto County and the surrounding area and will also be joining Rock Hill senior and Shawnee State signee Victor Aguilera this upcoming fall. Llewellyn said he plans on studying to become a high school history teacher while attending Shawnee State, and that ultimately one of his main reasons for choosing to play there was the proximity of campus to his home. When he joins the team this fall, Llewellyn is looking forward to continuing the Scioto County tradition in the Bears’ program, while also getting the experience to play with some international teammates along the way. 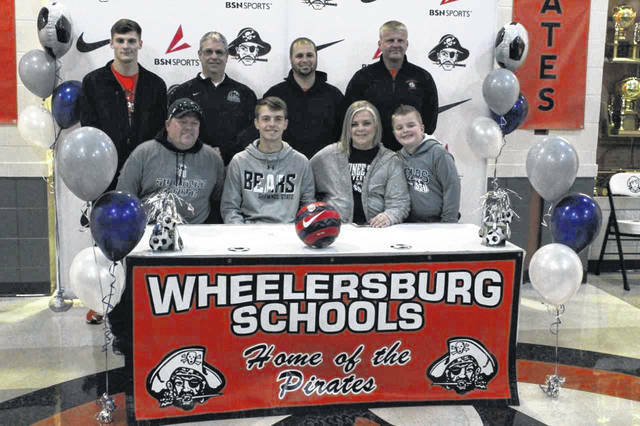 https://www.portsmouth-dailytimes.com/wp-content/uploads/sites/28/2019/01/web1_llewellyn_print.jpgWheelersburg senior Cameron Llewellyn signed his letter of intent to play soccer and attend Shawnee State University.